Alert! Alert! The DOPPLER research reploid has inspired a revolt in DOPPLER-TOWN. The Maverick VIRUS has broken through the Doppler ANTI-VIRUS, and it appears Doppler has caused it. All previous postings here about the anti-virus are incorrect. The anti-virus is a placebo. REPEAT: THE ANTI-VIRUS IS A PLACEBO! DopplerTown is over-run with Mavericks. Utopia has ended before it even started. Take cover quickly. Virus is spreading rapidly. Cain Laboratory is being infiltrated. MAVERICK HUNTER UNITS on FULL ALERT. MEGA MAN X and ZERO... mobilize! Grave Danger! --From the SNES Mega Man X 3 instruction manual. Play Mega Man X 3 Now! Mega Man X, Zero, and the rest of the Maverick hunters still have more work to do thanks to Dr. Doppler's army of Maverick Robots. Can X and Zero finally destroy all the Mavericks and wipe the Sigma virus from the face of the planet? 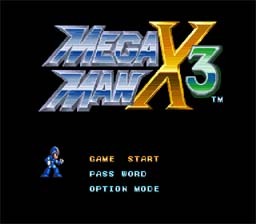 I strongly suggest you play through Mega Man X before playing Mega Man X3. In this game you don't have to search for the ability to dash, you have it from the start (If you are using a controller I suggest going into options and changing dash to R or L). Mega Man can fire small, medium, or large charged blasts. The longer you hold the button the more powerful it becomes. Just jump up against a wall to cling to it. You'll slowly slide down it. If you press jump and push towards the wall you'll be able to climb it. If you press jump and dash from a wall you'll leap to otherwise unreachable areas. Mega Man X3 adds new upgrades to the mix. Now the dash upgrade lets Mega Man dash left, right, and up when he's in the air. This is an upgrade you NEED. You'll have to find it in Blizzard Buffalo's stage. During the early levels of the game, you may not have enough power to get through some tough spots, so once every level you may call Zero by going into the menu and press L select (Default L) to pop up the COM window. Press A to call Zero. Zero will leave when he comes up against a boss door. If Zero is killed he is dead for the rest of the game and cannot be called again. Need even more firepower? Those X platforms spread throughout the game let you call on Mechs you've collected in other levels. To be able to use these X platforms, you'll need to get the Chimera Armor in Blast Hornet's Stage. It's hidden well, you'll need the Tunnel Fang to find it. To get the Super Golden Armor, you must destroy all the bosses (that means you have to kill Bit, Byte, and Vile with the weapons they are weak against) as well as collect all the upgrades, energy tanks, heart tanks, mechs, and NOT GET ANY upgrade CHIPS. While going through Doppler's fortress you'll meet an acid spitting boss. Defeat him and proceed. KEEP YOUR HEALTH HIGH. You have to have max health to get the upgrade. The first pit you come up to slide down, holding onto the left wall. You'll find a secret passage, and if you did everything right you'll see the capsule for the Golden Armor. Now you have all the Chip powers instead of just one. To equip X with the Z Sabre, you have to destroy Vile (you MUST kill him with his weakness). Zero must be alive, and you must not use him too early in Doppler's second stage. In Doppler's second stage, right after the water part you will see a boss door. Change to Zero and go in and fight the boss. Zero will give X his sabre whether he wins or looses. Use it like you would with Zero. Charge up till you're green, fire two charged shots, and the third will be the sabre. The Sabre strike can kill any boss in two hits.